The love for breaking something down to it's very basics and inventing something new is in a designers blood. So when I found a few sidewalk steals, I had to make them my own. Not without the help of a great upholsterer, the chairs below were pieces I picked up for their unique shape, minor damage, and undeniable price. Darya Ikat Jewel Print, Cambridge Port. This antique round back chair was a family heirloom our client wanted restored. I tried to handpick fabric that enhanced the charismatic features of each chair. 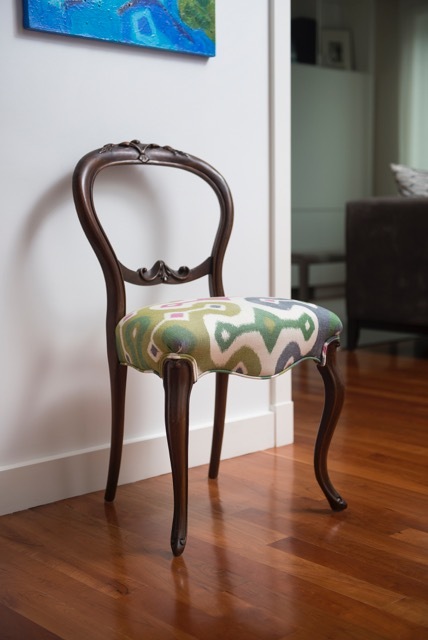 A funky Darya Ikat Jewel print by F. Schumacher felt a confident match with the specific shape of support the chair gave. The piece now focuses the clients eye to the rustic refinished wood and the newly reupholstered seat as a gorgeous contrast of old meets new. I have to be honest. I found the set of chairs below on a street corner with an asking price of $75 for the pair! It was love at first sight. So when I set my sights on restoring them, I knew the fabric choice demanded comfort. Originally upholstered with a screaming yellow velvet, I admired what the texture of the original fabric gave to the chair. A soft grey with a hint of purple, velvet fabric by the Design Connection gave the piece the comfort I was looking for and that's what we chose. Restored and refurnished, they now sit in my office under Priscilla Hayes, oil on canvas. 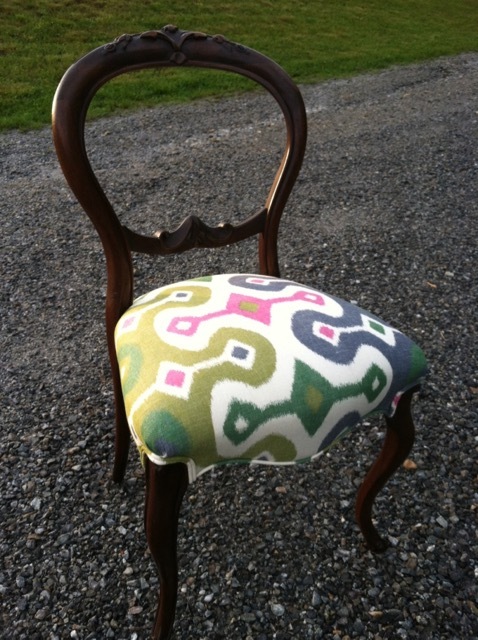 Restored Chair, Pinney Designs Studio. This forgotten cabinet was simply sitting in a clients basement, unused. The gold clasp at the cabinet doors close was what caught my eye and needed saving. I knew with a few touch ups and a fresh coat of paint this piece could give the home some subtle and unique detail. Restored cabinet in Cambridge Port, MA. The furniture made anew from these DIY inspired projects have found themselves in homes I've designed because they belong there. Being able to give furniture a new life with the help of professionals of the trade has created sentimental moments in the homes of my clients. Restoring a clients grandfathers cabinet, or a chair left in an attic allows me to create furniture that can't be manufactured or mass produced. These projects take the space out of a page in a magazine and make it uniquely my own. That is something I'm incredibly proud of. What are some of your favorite DIY inspired projects? Share below!